Search any homeopathic website and you'll find ginger-based products that promise to shrink your waistline. For centuries, humans have used ginger root for everything from digestion to headaches, but only in the past decade have scientists started recognizing the clinical, medicinal properties of ginger. So powerful is pure, dry ginger root that at least three different studies have linked it to weight-loss properties. Always consult your doctor before beginning any weight-loss regimen or before consuming any herb or spice, such as ginger powder, for the purposes of treating any condition, including being overweight. When you don't feel satiated after eating a meal, you're more likely to continue eating. A 2012 study conducted at Columbia University and published in "Metabolism: Clinical and Experimental," found that subjects who consumed 2 grams of dry ginger powder with their breakfast reported feeling more satiated three hours later than those who didn't consume the ginger powder. Because ginger powder itself is hard to ingest, subjects stirred the recommended dosage of 2 grams into 1 cup of hot water. When you eat fat, your body either stores the excess lipids inside your fat cells, causing them to expand, or the fat passes through your digestive track. Reducing your body's rate of fat absorption supports weight loss. A 2011 study published in, "Journal of the Science of Food and Agriculture" found that ginger, along with other spice compounds, stimulated pancreatic activity and increased the production of bile salts. Both of these changes resulted in lower fat absorption when eating a high-fat diet. Similar to dietary fiber, dry ginger powder also increases the speed at which your intestinal and gastric tract empty. A 2008 study published in the "European Journal of Gastroenterology and Hepatology" had subjects ingest three capsules of ginger powder, totaling 1,200 milligrams, after an eight-hour fast. Subjects ate a low-nutrient soup with their ginger. Within 90 minutes, healthy volunteers were passing the soup served with the ginger powder capsules. This does not mean that eating ginger powder will make you pass an entire meal; however, ginger can support regular digestion, which in turn supports weight loss. 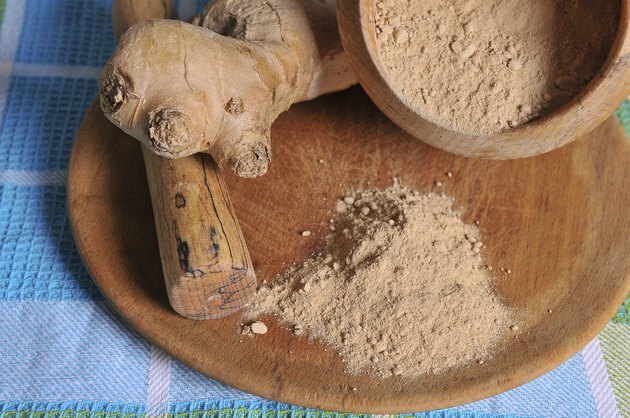 Regularly consuming dry ginger powder helps support your efforts to lose weight, but it's unrealistic to expect major weight loss without making other lifestyle changes, such as diet and exercise. Reducing the number of calories in your diet, along with the quantity of fat will reduce your body's current fat reserves. Exercising for 30 minutes a day, at least five days a week, will also boost your metabolism and build muscle mass. Since muscle tissue burns more calories than fat while resting, increasing your muscle mass raises the number of calories you burn while resting.